Is Becoming An Airbnb Host Worth It? How Much Money Can You Make? How Much Money Can You Make As An Airbnb Host And Is It Worth It? You may have heard about people earning big bucks sharing their home with travelers through Airbnb practically being an Airbnb host. You might even be part of the Airbnb community already. You are if you ever used the service to find a place to stay for yourself in the past. Should you take it to the next level and become an Airbnb host? Is it safe to invite strangers into your home? What kind of risks are you taking if you go for it? And if you do take the plunge, is it worth it and how much money can you make? By the time you finish reading this in-depth Airbnb host opportunity review, you will not only know the answers to these questions. You’ll also definitively know if becoming an Airbnb host is for you or not and if so, how to get started. What is Airbnb and How Did it Get Started? Back in 2007 two struggling roommates Brian Chesky and Joe Gebbia put their thinking caps on to try to solve their financial woes. They figured out that if they throw a couple of air mattresses down in their living room and charge people to sleep in the space, they’ll be able to pay rent each month without panicking. (That’s where the “Air” comes from – air mattresses). Lucky for Brian and Joe, they lived in San Francisco where hotel rooms were scarce and expensive. They launched a site to streamline their business, got some funding as a small start up and the rest is history. By pairing hosts who have space to list in Airbnb’s marketplace and travelers who need a place to hang their hats for a short time, they’ve created a global company and community. The company now boasts over 3 million housing listings in 65,000 cities and 191 countries – and those numbers are growing by the day. Why are Travelers and Hosts Drawn to This Service? What’s in it for them? First, Airbnb guests get a travel experience they would otherwise not have because your visitors interact with locals. 74% of all host lodgings are outside of the main hotel clusters. That means folks get to explore new places. And by the way, they usually pay far lower rates than stodgy hotels charge. One study referenced by Wikipedia reported that guests can rent an entire house for the same price as what a hotel charges them for a single hotel room. Hosts also score. They meet people from all over the world, gain new friends, generate (potentially life changing) side money and do a solid for humanity at the same time. Win-win if you ask me. So, yes, it’s a very cool idea. But is it a cool idea for you to become a host? That’s what we’re here to find out. 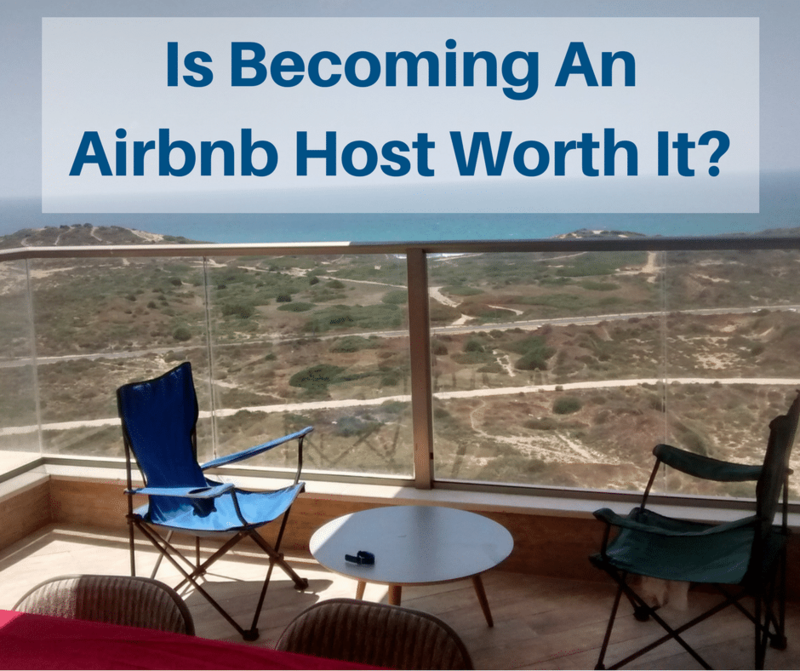 What Are You Signing Up For When You Become An Airbnb Host? How much space to list. When to list your place. Who gets to stay with you. Given those constraints, Airbnb markets your housing offer to travelers for you. When you agree to allow a guest to book your space, you will pay Airbnb a 3% hosting fee once the guest is charged. The company also charges guests 6% to 12% as a guest services fee. How Much Can You Make As an Airbnb Host? It’s difficult to make generalizations about income. As I said, you decide what you charge. And you charge different amounts based on length of stay and time of year or not. It’s up to you. But what I like is that Airbnb is there to help you find a price that will be profitable for you and competitive for the market if you want their input. Since they know what people are actually paying in your market, I think this is a huge plus. If you want to get a rough idea of how much you might potentially earn, simply go to the Airbnb calculator, plug in your zip code and the number of nights to want to list your place. Another way to do this is to search the site itself for listings which most closely resemble yours and get a nightly pricing estimate. Of course this will be a rough estimate but it will give you a good idea of whether or not we’re talking about pocket money or get-out-of-debt/save for retirement money. If you want to outsource the pricing decisions, Airbnb has you covered. They have a service called Smart Price. If you elect to use it, the algorithm will automatically adjust your rate based on supply and demand at the time. If you opt in to use this free service, you set a minimum and maximum price and the whizzbang program does the rest. Of course, you don’t have to use this. It’s free and it’s available, but it’s not mandatory. So, it’s difficult to know exactly how much you will earn until you actually give it a try and then decide how much you want to list your space. But I am convinced that as a host you can make serious dough. According to some experts, you can earn 81% of your rent if you list one room in a two-bedroom home using Airbnb. Not too shabby. The Wikipedia study I referenced above reported that during the housing crisis, 53% of the hosts said the extra income they earned through Airbnb was enough to help them keep their house. Imagine what you could do with that money if you didn’t face that problem? When you become an Airbnb host, you are in the hospitality business. You aren’t simply sharing your space. This means you take responsibility for making your guests’ stay as comfortable as possible. At its most basic level, this means you’ll need to provide bedding, linens, towels, soap and cleaning supplies, kitchen utensils, coffee, tea, etc. Once you sign up, Airbnb will walk you through this with checklists so don’t worry. Just please understand that it’s on you to make your guest feel welcome. Along those same lines, you should create a standard guest greeting to explain how everything in the apartment or home works and point out all the amenities. Include your internet wireless password, maps, a list of great sites to see, places to go and restaurants to dine at. The last host we stayed with in Prague did this and it made us feel very welcome and relaxed. Do the little things that cost little and take almost no time. It will pay off big time. It might take all of about 30 minutes to get set up on the site and be in business. Plan on spending a few minutes daily answering inquiries and booking guests. If you set your home up properly you shouldn’t need to physically meet your guests when they arrive but it is a very nice touch and it will help improve your ratings and reviews. The only serious time commitment is cleaning up after your guests depart. Depending on the size of the room, apartment or home, this could take anywhere from 30 minutes to 4 hours. And depending on how long your guest stays and whether or not you charge a cleaning fee, it might pay to have a housecleaner do this. What Will It Cost You To Run This Business? Your costs depend on your situation. I’m assuming that you already have the space and you aren’t going to buy or rent a place just to get into this business. If you are thinking about buying or renting a place for the sake of listing it out through Airbnb, the cost/benefit discussion is more involved and beyond the scope of this post. So, assuming you plan on listing out some space that you already have and isn’t currently being used, you have no additional housing costs. You will have to provide consumables like soaps, coffee, toilet paper etc. You might expand the list of items you are willing to provide to include eggs, milk, bread, etc. These costs are minimum but add significantly to your guests’ experience. In my opinion, these are good investments for you. Utilities could add up as guests might be more liberal with leaving the lights and A/C on if they aren’t paying the bill. And as I said before, you may have to pay for cleaning and taxes. I think a good rule of thumb is to be conservative and figure 25% of your gross income will go to costs. But please do your research and number crunching. Costs vary widely depending on your own particular situation and based on the local tax laws. Will You Be Able To List Your Place As Often As You Want To? Based on the snooping around that I did, it seems that most big city Airbnb hosts report occupancy levels between 60% to 94%. The way I read this is, if I want to list my place out for 60% to 94% of the time, I should not have a problem doing so depending on where I live. If I live in a big city and I want to list my room or entire place for 60% or less of the time, I shouldn’t have a problem doing so as long as I am flexible on the dates and do a decent job on pricing and marketing. How Much Control Do You Have As An Airbnb host? First, as I said, you decide when to list, how much space to list (a room, several rooms, the entire pad) and the nightly, weekly or monthly rate. You also determine the house rules. To me, that’s sounds like a lot of control. The last thing you want is to create a grumpy neighbor so you want to take steps to nip that problem in the bud before it even becomes an issue. The best way to handle this is to be proactive. Let your neighbors know that you’ll be hosting with Airbnb. Tell them that you have already confirmed that what you are doing is legal. Go on by telling them that it’s important to you that they are not inconvenienced. Tell them about your vigorous screening and stringent house rules. End by giving them your cell and tell them to call anytime – day or night – with any concerns. At the same time, you can provide your neighbor with the link to Airbnb’s Neighbor Complaint Tool. This sends instant feedback to the company and allows your neighbors to provide honest feedback. If there are legitimate problems, the company will look into it and potentially end the business relationship with you. This assurance and social accountability may be all that’s needed to turn your neighbor into an ally – and maybe even a potential host or co-host you can help make money with. When you join the Airbnb community as a host, you are in essence subletting your property for a short time. If you are a renter yourself, you have to make sure your lease doesn’t prohibit you from becoming a host. If you own your property, you still have to make sure there are no homeowners covenants, conditions or restrictions that forbid it. Even if you get the all-clear from your landlord or homeowners association, you might have to deal with city laws. Some cities demand that you register and get a license in order to become part of the Airbnb host world. The company has a great site that lists which cities have which requirements. Study that carefully before signing up. Of course, remember that when you become a host, you are in business and you’ll have to pay taxes on your net income. Sorry…. no way around that. Can You Learn More About Your Guests Before Agreeing To Host Them? Yes. Airbnb requires that guests and hosts create profiles so each party knows who they are going to be staying with. There are guest and host reviews and ratings as well. As a host, you have the opportunity to review your traveler’s reviews and ratings before agreeing to host them. You have no obligation to accept anybody for any reason. As a host, you’ll have access to a private secure messaging network where you can ask your traveler whatever you like to get a clearer sense of who the person is. They can also ask you questions. You can tell a lot about a person by the questions they ask so this is a good thing. You can also require the prospective guest to send you a scanned government-issued identification document to make sure they are who they say they are. Should You Worry About Hosting Problematic People? Based on my research, I don’t think this is a big concern. During the research I did for this post, I didn’t’ find many host complaints. And the success of the company in such a short period of time tells me this isn’t a problem too. If a lot of guests and hosts had bad experiences, Airbnb would not be as successful as they are. I’ve used Airbnb a number of times. The reviews helped me (and the host) make good decisions and the stay was always pleasant. Also, because I enjoy talking to people, I usually asked my host what their experiences were hosting and I don’t remember ever hearing anything negative. This is not to say that it can’t happen. I’m sure it can and does. But the success of the company, the online reputation reviews and ratings and my own personal experience tells me that having weirdos show up to stay at your place should not be a concern as long as you screen and review the profiles. You can also link your Airbnb account to Facebook and other social media sites. This will help you screen your would-be guests even more. You can do that by becoming friends on Facebook and checking out their home page. That will tell you what kind of people your potential guests really are and it should help you make a better decision about renting to them or not. If on the other hand, you want to scale back the screening, you can simply let Airbnb know the minimum requirements you have and then allow a traveler to book a stay at your place automatically. You don’t have to use this service of course but it is available. Airbnb provides a $1,000,000 host guarantee which is pretty good. In essence, this protects you against third-party claims of property damage or bodily injury up to $1,000,000. Airbnb gets you paid through their Security Payments system 24 hours after your guest checks in. What If You Have The Space But Not The Mindset Of Running The Logistics? Airbnb really is a community. I really like that about these people. If you don’t have the time or stomach for running the business, the company will pair you up with a highly-rated partner who you can offload much of the burden to. How Does Airbnb Help Me Grow This Business? For a company that doesn’t charge franchise fees, these people recognize that they will only be successful if you are. For that reason they created a number of easy-to-use guides and toolkits that are designed to help you create an attractive listing, communicate with your guest and manage the relationship before, during and after your guest departs. They also take the idea of community to heart. Airbnb created an online community where hosts from all over the world connect and help each other be more successful. They also offer 24/7 support for hosts so no matter what you have to deal with as a host, you won’t have to deal with it alone. Remember, Airbnb wants to make it as easy as possible for you to succeed so they do whatever they can to support you. Another way they do that is provide you with a list of services you might want to tap in to that you might need as a quasi-landlord. When I first learned about the Airbnb host opportunity, I was skeptical. I was concerned about having creeps and weirdos hanging around in my crib. On top of that, I didn’t think there was that much money to be made. But having done the deep research, I think this is a killer idea for the right person. Chances are very good that there are a lot of travelers who are looking for a place to be hosted in your area and are willing to pay for it. Since the company does a very good job at vetting potential guests (and hosts), I wouldn’t be too concerned about having some maniac loser sitting around your breakfast table. Sometimes hosts have guests that they would not invite back but I don’t think this happens often. Depending on how much you are willing to host, you could put a few hundred bucks in your pocket each month or a few thousand. It is up to you. And if you get really into this business, you can recruit other hosts, manage the guests and earn even more. I believe that this has tremendous opportunity. So, if you are looking for ways to raise more than just pocket money quickly without spending a lot of time or money setting up or running the business, this could be your ticket. It’s absolutely worth a try. People write me all the time about their financial difficulties and I think this is one way to solve that problem big time. Even if you don’t need the money, if you like meeting new interesting people and want to be part of this global community, I think this is something you should experiment with. However, if you are looking for a passive income stream, this ain’t it. When you become a host with Airbnb you won’t need to put a lot of time in but it does require someone responsible to be hands-on. If you want to travel more and/or have less interaction with people, you should pass. Airbnb says that trust is the bedrock foundation of their business. I looked at every resource I could find. I also scoured the net for complaints against the company. Yes here and there I found grievances between hosts and guests. That’s to be expected. But I didn’t find any conflicts between Airbnb and hosts or guests. The company seems to deliver on their promises. Hosts are making good money. Guests are having great experiences. Can you think of any reason why you wouldn’t give a hosting a try? Click here to sign up with Airbnb as a host. What I don’t like from Airbnb and all this websites is that when we book for a specific location is because we want to stay in that location not 2/5/10 mi. away so if there is nothing on the specific area they should say it but advertising that near by yes there are some other place that can accommodate. Also when I choose 2 beds it means I need 2 beds but then they show you a bed and a sofa in the living area that can be turn into a bed, but I want a real bed not a sofa bed, why? Because I am on vacation relaxing and the sofa is to seat so I don’t want every day to open the sofa, close the sofa, to take a nap open the sofa close the sofa, no way!!!! Lot of host or owners don’t want to explain you very well when it comes to shared place or space because they know most of the guest don’t want them to be around like inspecting their place so they just talk/tell you superficially and then u have to lose your time contacting them to make sure if it’s a shared place or not and most of them respond not to pleased, not nice. Some owner put up picture of nice place (think pics from day 1 they start to live in with everything new) but whe u arrive it looks old and not like the pics and owners start telling u oh! Sorry we took it yesterday because was just broken, it desapear, last owner stolen and blah blah blah that we will never believe it. Great post! I’ve thought about becoming an Airbnb host before but have always had cold feet. The idea of having strangers, I mean guests, in my house that I don’t really know makes me nervous. I imagine that most guests are trustworthy and leave with a good experience for you and them, but unfortunately some horror stories get blown out of proportion. I’d be curious reading their site more to learn about their insurance coverage that they offer and how it would relate to my own homeowners insurance as well as tax implications/benefits that I could get. Probably not in my current house given the setup but definitely something to keep in mind in my next house!